Tutored by the legendary British art dealer Sir Joseph Duveen in the early 1920s, Marjorie Post initiated her appreciation of the best qualities of the fine and decorative arts. She and her second husband Edward F. Hutton had built the largest triplex apartment in New York City. The architectural styles of the handsome interior were of the Louis XV and Louis XVI periods. 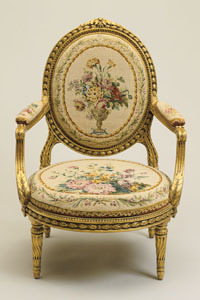 To embellish her home’s impressive rooms, she amassed a splendid collection of 18th-century French furniture. In addition, she began collecting porcelain examples of the French royal manufactory of Sèvres. Today, displayed throughout Hillwood, her French decorative arts collection remains one of the most important in America. The neoclassical tradition of Louis XVI, characterized by harmony, balance, delicate decoration, and superb craftsmanship and design, pervades the furniture in the French Collection. Exquisite writing and dressing tables, commodes, desks, and chairs populate the Mansion, most notably in the Entry Hall, the French Drawing Room, Dining Room, and the Post Bedroom. Arranged to perfection with the collector’s savoir faire in collaboration with the prominent New York interior designers of French & Co and McMillen & Co, these pieces enhance each space, contributing to the elegant flavor. Marjorie’s collection grew so much in the first two decades of the 20th century that, following notably in the footsteps of J. P. Morgan, she engaged several authors to prepare a catalogue of her collections to be privately printed. Although the project was abandoned with the stock market crash of 1929, her collecting of French furniture continued throughout her life. No porcelain factory in 18th-century Europe reflected courtly taste better than Sèvres. The form and color of its pieces expressed the frivolity and the sheer joy of life of the privileged during that time. In Marjorie Post’s collection, reflecting her taste for the classical and the beautifully crafted, items range from examples of the early years of the factory at Vincennes to a grand selection of 18th-century pieces both in soft-paste and hard-paste. Included in this assemblage are some outstanding vases as well as tablewares—plates, cups, and saucers—from celebrated services. 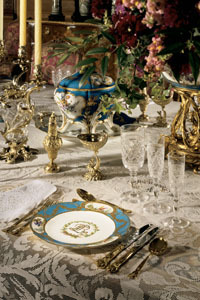 While much of the Sèvres collection was intended for display, Marjorie also acquired pieces, in particular tableware, for use when entertaining. Dining at her table evoked the grandeur of the great banquets of the past, with lace-covered tables displaying porcelain sets commissioned by royalty. 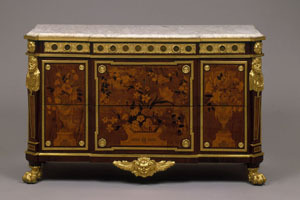 The collection of gold boxes at Hillwood testifies to Marjorie’s love for precious objects with historical associations. She began buying French examples in the 1920s. They form the core of her collection and influenced her later collection of work by Fabergé. Edith Wharton defined the accumulation of bibelots as “the voluptuousness of acquiring things one might do without,” and in this she identifies the ultimate allure these small creations may have had for collectors like Marjorie. Marjorie purchased a set of Beauvais tapestries from Duveen in the 1920s based on the designs of François Boucher. Adorning the walls of the French Drawing Room, they are fitted into wooden frames, rather than hanging freely as they would have traditionally. Another important example of rare tapestries in the collection includes an imposing suite of chairs covered with Gobelins tapestries. Unlike the Beauvis tapestry works, which took private commissions as well as royal ones, the Gobelins factory worked almost exclusively for the crown, so these covers are very rare.